For a city that doesn't have too many terrace houses, there is a surprisingly large number of them gathered in a small area along Petrie Terrace, overlooking the Roma St parklands. 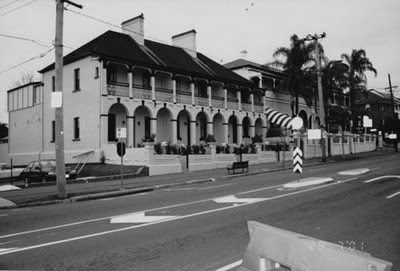 The ones below are known as O'Keeffe's terraces, named after John O'Keeffe, a Brisbane builder of the late 19th century. Firstly, the way they look now. This is the way they were photographed in 1977, following restoration. And before restoration - they were built in 1880. Another cluster of well-known terraces are these ones, known these days as Princess Row. They were previously referred to as Costin's cottages, as they were built by chemist/developer William John Costins around 1863. They were originally a row of four terraces. all with double dormer windows, but the terrace on the far left of my picture has been converted to a shop. 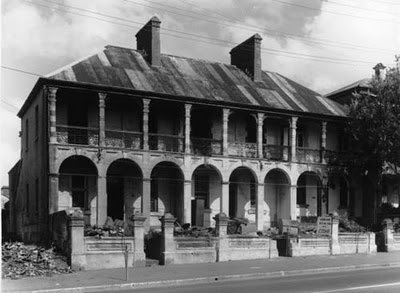 Early development in this inner-city area, originally called Green Hills, was small workers' cottages to house the immigrants pouring into Queensland. Petrie Terrace has even more terraces houses, both old and new.